The Firestone Grand Prix of St. Petersburg, organizers of the annual 5K run and walk event held on portions of the 1.8-mile temporary street circuit in downtown, and Modern Business Associates (MBA) are also proud to continue their support for the Police Athletic League (PAL) of St. Petersburg. For the third year, the event’s proceeds will be donated to PAL for its numerous programs serving local children and teenagers. MBA has served as a sponsor of the 5K Run since 2014. “The Police Athletic League of St. Petersburg is extremely grateful to our partners for their support and belief that all children, even the most at-risk living in our community, can grow to be healthy, productive adults,” said Heather Robb, director, Police Athletic League of St. Petersburg. “Since 2016, contributions from the Firestone Grand Prix and proceeds from the Modern Business Associates 5K race have reached nearly $120,000 enabling PAL to continue to provide enriching activities and eye-opening experiences to the hundreds of young people who come through our doors. We are excited for another great race weekend.” The 5K’s start/finish line will be on Bay Shore Drive NE on the water side of North Straub Park just south of The Vinoy Renaissance St. Petersburg Resort and Golf Club. The course will follow a route through Downtown St. Petersburg entering and exiting the Firestone Grand Prix track’s layout at Turn 9 near Central Ave. and Pioneer Park. “We truly appreciate the support and partnership of Modern Business Associates to make this fantastic run and walk event possible on the Firestone Grand Prix of St. Petersburg course,” said Kim Green, co-owner, chairman and CEO of Green Savoree Racing Promotions. “Over 1,000 runners and walkers will compete for a great cause! 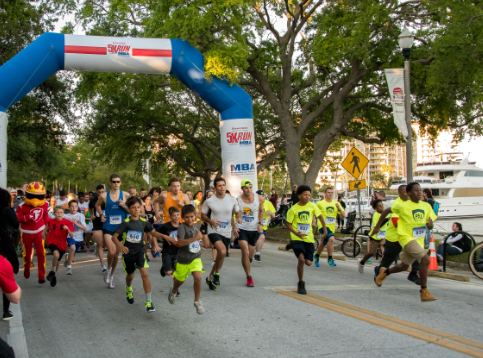 While it promotes health and wellness in our community, most importantly, this race weekend tradition accelerates PAL’s mission to positively impact the lives of our local children and teenagers.” Registration is now open at gpstpete5k.com. An advance price of $30 is offered through Jan. 13, 2019, then the fee increases in $5 increments leading up to the event. On site registration the day of the race will be available for $45. Additional charitable donations are also accepted on the registration website to further the MBA 5K Run’s impact in supporting the mission of PAL of St. Petersburg. Registration includes race entry with chipped timing bib, commemorative finisher’s medal, T-shirt, and Friday general admission to Firestone Grand Prix (if race packet is picked up in person on Thursday, March 7 – location TBD). Website: gpstpete5k.com The complete racing and activities schedule for the Firestone Grand Prix of St. Petersburg will be released in early 2019. For additional ticket pricing, grandstand seating and festival information, visit gpstpete.com.